BECIL Recruitment 2018: Broadcast Engineering Consultants India Limited has issued official notification for 20 vacancies of call center executive, project manager. Eligible and Skilled Candidates Broadcast Engineering Consultants India Limited Jobs is able to send the 2018 applications through offline mode from their official website becil.com. Interested candidates can make offline application for BECIL Call Center Executive, Project Manager vacancy 2018 till the last date of 12.11.2018. Candidates can download official notifications from the official website before applying for this vacancy. To obtain more information on Broadcast Engineering Consultants India Limited recruitment, qualification details like eligibility details such as education qualification, age limit, selection process, application fees and how to apply, important links, courses, admission papers, results, previous papers, etc. Are given below. Interested and qualified candidate can download from website becil.com in prescribed form and send your application on or before 12.11.2018. The prescribed format with photocopy of all relevant documents should be submitted to the address specified below. Address: BECIL's Corporate Office, B-CIL, C-56 / A-17, Sector-62, Noida -01307 (UP). BECIL Recruitment 2018: Broadcast Engineering Consultants India Limited has issued official notification for 50 vacancies of Data Entry Operator. Eligible and Skilled Candidates Broadcast Engineering Consultants India Limited Jobs 2018 are able to send application forms through offline mode from their official website becil.com. Interested candidates can apply online for BECIL Data Entry Operator Vacancy 2018 till the end of September 17, 2018. Candidates can download official notifications from the official website before applying for this vacancy. To obtain more information on Broadcast Engineering Consultants India Limited recruitment, qualification details like eligibility details such as education qualification, age limit, selection process, application fees and how to apply, important links, courses, admission papers, results, previous papers, etc. Are given below. Data Entry operator A graduate from an accredited university with English typing speed of 35 WPM on computer. Interested and qualified candidate can download the website from Becil.com in the prescribed form and send your application on or before 17th September 2018. The prescribed format with photocopy of all relevant documents should be submitted to the address specified below. Assistant General Manager (HR) at BECIL Bhawan, C-56 / A-17, Sector-62, Noida 201307 (UP), Corporate Office of BECIL. BECIL Recruitment 2018: Broadcast Engineering Consultants India Limited has issued official notification for 20 vacancies of Data Entry Operator. Eligible and Skilled Candidates Broadcast Engineering Consultants India Limited Jobs is able to send the 2018 applications through offline mode from their official website becil.com. Interested candidates can apply offline for BECIL Data Entry Operator Vacancy 2018 till the closing date of 14/09/2018. Candidates can download official notifications from the official website before applying for this vacancy. To obtain more information on Broadcast Engineering Consultants India Limited recruitment, qualification details like eligibility details such as education qualification, age limit, selection process, application fees and how to apply, important links, courses, admission papers, results, previous papers, etc. Are given below. Qualifications and Experience: A graduate from an accredited university with English typing speed of 35 WPM on computer. The selected candidates will get Rs. 17,498 - From the organization. Interested and qualified candidates can download from website becil.com in prescribed form and send their application on or before 14/09/2018. The format prescribed with photocopies of all relevant documents should be deposited at the address mentioned below. Assistant General Manager (HR) at the corporate office of BECIL in BECIL Bhawan, C-56 / A-17, Sector-62, Noida -01307 (UP). Recruitment of BECIL 2018: Broadcast Engineering Consultants India Limited has released the official release of Monitor's 25 vacancies. Eligible and trained candidates can submit the application form for Broadcast Engineering Consultants India Limited Jobs 2018 in offline mode from their official website becil.com. Interested candidates can request offline for BECIL Monitor Vacant 2018 until the last date, which is 17-09-2018. Applicants can download the official notification from the official website before requesting this job. 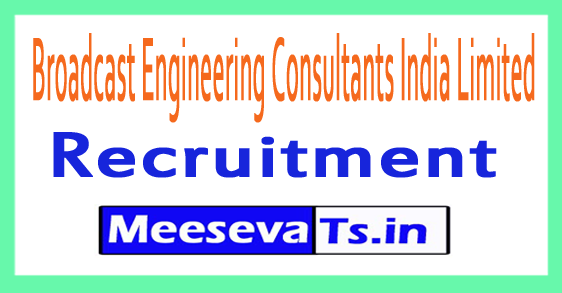 For more information on Broadcast Engineering Consultants India Limited Recruitment as claim details such as educational achievement, age limit, selection process, application fee and how to submit the application, important links, syllabus, tickets, results, previous documents are given below. The selected candidates receive Rs. 28,635 / - per month of the organization. Interested and Eligible applicants may download the required form from the website becil.com and submit their application form on 17.9.2018 or earlier. The prescribed format along with the photocopy of all relevant documents should be sent to the address below. Recruitment of BECIL 2018: Broadcast Engineering Consultants India Limited has released the official release of 20 vacancies from Consultants. Eligible and trained candidates may submit the 2018 application form for Broadcast Engineering Consultants India Limited in offline mode from their official website www.becil.com. Interested candidates can apply online until the last date, 13-07-2018, for the job offers of BECIL Consultants 2018. Applicants can download the official notification from the official website before requesting this job. For more information on Broadcast Engineering Consultants India Limited Recruitment as claim details such as educational achievement, age limit, selection process, application fee and how to submit the application, important links, syllabus, tickets, results, previous documents are given below. The selected candidates receive Rs. 50,000 / - per month from the organization. Interested and Eligible applicants may download the required form from the website www.becil.com and submit their application form on 13-07-2018 or earlier. The prescribed form along with a photocopy of all relevant documents should be sent to the address below. Broadcast Engineering Consultants India Limited BECIL released notification for the recruitment of the posts of 901 Patient Care Manager, Patient Care Coordinator underneath BECIL Recruitment. All Eligible and Interested applicants may additionally observe Offline mode earlier than the Last Date i.E., 30-04-2018. Other Details Like education qualification, age restriction, choice system, software rate & the way to practice, essential hyperlinks, syllabus, admit playing cards, outcomes, previous papers . 1. Patient Care Manager (PCM) – Bachelors Degree in Life Sciences with full time Post GraduateQualification in Hospital (or Healthcare) Management from a diagnosed university + At least one year enjoy in a health facility after acquisition of the aforementioned qualifications. Interested and eligible candidates can download in the prescribed shape from website www.Becil.Com and send their software from on or before 30-04-2018. The Prescribed layout along side image copy of all relevant documents ought to be submitted to the cope with referred to under. Assistant General Manager (HR), BECIL’s Corporate Office, BECIL Bhawan, C-56/A-17, Sector-62, Noida-201307 (U.P).